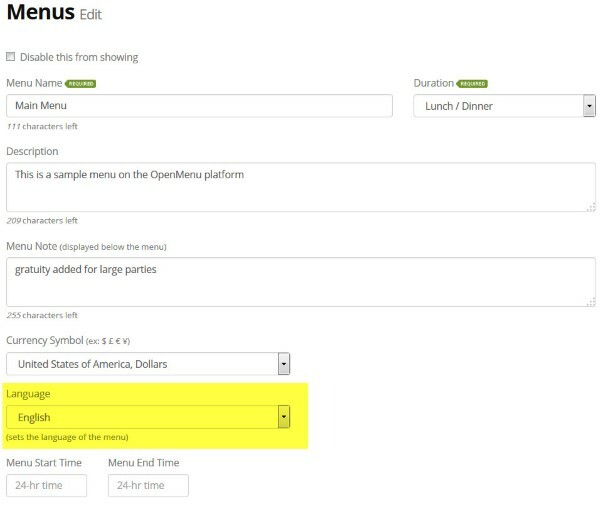 OpenMenu is setup as a global standard for restaurant menus and in doing so restaurants have the option of setting the language for each menu. note: Did you know that you can enter your menu into OpenMenu in different languages, with different currency symbols, and have all the information stored in a single location. This means your OpenMenu can contain your menu in multiple languages. 1. Edit an existing menu. 2. Assign the Language from the drop-down.